To Sum It Up: Ruby thought she was protecting Liam by erasing his memories of her, and she’s horrified to learn that he’s inadvertently put himself in extreme danger. He’s unaware he’s carrying sensitive data that certain people would kill for. Ruby, now working for the Children’s League, is tasked with recovering the information, but of course the mission takes on a much more personal meaning for her, no matter how hard she tries to convince herself that she needs to let go of any illusions of a future with Liam—for his own good. Review: After being floored by the awesomeness of The Darkest Minds, how much more praise can I possibly heap on its sequel, Never Fade? The answer is: plenty more! If you want a sequel that delivers in every way, from character growth to impeccable storytelling, then you need to start this series ASAP if you haven’t already. Alexandra Bracken is a genius, and this book is a work of utter genius. The ending of The Darkest Minds wrecked me for a few days, with Chubs’s fate unknown after being shot and Ruby removing Liam’s memories of her. That’s right. She erased herself from his mind and sent him off to be safe. Meanwhile, I wanted to cry in a corner somewhere with my crushed heart because those two so belong together! Forever! I was also devastated by the apparent breakup of their little group, which had such amazing chemistry in The Darkest Minds. Never Fade finds Ruby now in fairly deep with the Children’s League, the sketchy organization that claims to work on behalf of the kids persecuted because of their powers. The League isn’t as benevolent as it wants the public to think it is, however, thanks to a few agents who believe the League needs a new direction—one that’s at total odds with helping kids. I was still skeptical of the motives of Cate, the League agent who got Ruby out of Thurmond in The Darkest Minds; despite seeming to truly care about Ruby and her other charges, I couldn’t forget that Cate was still League. And that’s one of the joys of reading this series: there are several shades of gray to the characters. I was also a little skeptical of the addition of a few new characters, most notably Jude and Vida, two of Ruby’s League companions. Again, the group dynamic in the previous book had been so perfect that part of me didn’t want to see Ruby fall in with anyone who wasn’t Chubs and Liam. It’s impossible not to love Jude, though; the kid is just too sweet. Vida is the total opposite of Jude, all sharp edges. I loved that she was both a smartass and a badass, and oh how I hope that she and a certain character end up together because when two people exchange that many insults, it’s gotta be love! In case it wasn’t already apparent, of course I’m going to say that everything about the book was impressive. I do want to make special mention of Ruby’s character development, which is simply outstanding. She’s so strong, as evidenced by her protectiveness of Jude. Ruby also continues to struggle with her conscience when she uses her powers, worrying that even though she may be doing so to save her friends, that still doesn’t make her any better than a monster like Clancy Gray. Crazy Clancy had no such qualms in The Darkest Minds, but Ruby is most decidedly nothing like him. She’s a heroine through and through, whether or not she believes it herself. I’ve come to expect heart pulverizing endings from this series now, and Never Fade continues in that tradition. I was so traumatized that I couldn’t even cry. Ruby and company have already endured so much, both physically and emotionally, that I don’t know where they find the strength to keep pushing forward. But they do, and I cannot wait to see how the trilogy concludes. 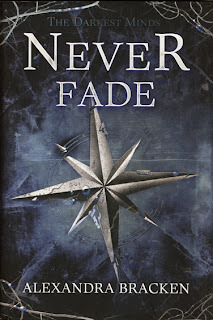 All in All: Sometimes you just know that a book is going to be a five star read even before you crack open the cover, and Never Fade did not disappoint in any way. Heart pulverizing endings... who can say no to that?! I was expecting the heartbreak but still couldn't cope with it when it happened, lol.